The question was put into context by Franken as a "surrogate of the Trump campaign". Here is the direct quote from Jeff Sessions "I have been called a surrogate a time or two and I have not had any communications with the Russians." I'm not saying it is right or wrong, but this is what he said. You are ignoring the question asked. The person asking the question makes the context not the person answering it. I'm not arguing with you. I was just trying to put his exact quote out there because somebody earlier had misquoted Sessions. Sessions to be on Tucker tonight. You might should listen to his answer again. That may be what he meant but it is not what he said. That was my take on it when it came out last night. jerp said it best........another unforced era........and Sessions has been around the block waaay to many times to be mis-handling slow pitch ground balls. Probably the smartest move at this point. Probably the ONLY move at this point. Flynn lied. So did Sessions. Undeniable. If there's no wrong, nothing to hide; why did they lie, why did they say "No contact in any form"? There's some smoke here, boys and girls, can't get around that, no matter what you choose to tell yourselves; there is a fire. Small, insignificant, over the big picture? Perhaps. Or? Let's investigate Sessions. And while we're at it let's investigate Hillary Clinton, The Clinton Foundation, Eric Holder, Loretta Lynch, etc, etc. I like Jeff Sessions a lot but he handed the Dems a club to whack him with in his answer to Sen. Franken. If he had said "Yes I talked to the Russian ambassador as part of my duties on the Armed Services Committee, but did not discuss the election" all would be fine. Denying he talked to the Russians at all was a mistake. We all know the context of the question was about influencing the election but it does not matter now - the dems and the media will hammer away on this forever. It was an unforced error on Session's part. I agree with your objective analysis. Im not sure Russia got the memo about being in cahoots with the Trump admin. Right! Because everything on google is true and not fake. The democrats are 100% throwing anything against the wall and hope it sticks, there agenda is to bring down Trump. Whatever happened to common sense and good judgement? So you're denying that Jared Kushner met with the Russian ambassador during the campaign? I am very curious to see this today. What if every meeting with the Russians was to assure them Trump is going to honar the uranium deals the Clintons set up? What exactly do you fear happened in these meet and greets? Why is Russia such a thing with liberals? Why the original denials of contact? Why not just be truthful about all of those involved? Instead the trump admin keeps getting drug the mud by the media. He should hold a press conference today and spill the beans about everyone in the admin that has met with the ruskies & what the conversation was about. Or he can just keep on looking like a liar and a con-man. His choice really, unless he is hiding something. Why does everyone want and care about his taxes? Most politicians release their tax returns because they are public servants. Trump wasn’t a politician he was a private citizen that dealt in big business, his business. To me it’s just another dem talking point to stir the pot over nothing. Being a private citizen and a business man you do what’s best for your business and yourself not your country. I could be wrong as I’m not a business owner but the ones I’ve known have never sat around thinking what can I do to better my country before taking care of my business. You should invest in Kleenex with all that **** crying. Maybe we should give Russia billions of dollars for no reason at all and they'll stop being meanies. Oh wait. They don't openly call for the destruction of America, they aren't qualified for the free American ATM machine. I cannot confirm or deni, but really why does it matter? What's the liberals objective here? What's the end game? To destroy trump? I like that he's playing the media, and being secretive. It's not required by law to release your tax returns, he's not like any other pres we have had. It's his tax returns not public. If he'll show his returns it'll show who his business partners & of course where his funds come from. What I don' understand is Trump International has tried for years to open a Trump Tower in Russia & China. China told them to pound sand & wanted no part of Trump International but just last month Trump won a law suit in China for the illegal use of Trumps brand. Russia on the other hand hasn't declined or accepted Trumps offer ??? You claim to be a libertarian? Most libertarians are fundamentally opposed to the IRS. Never said I supported the IRS. Your smart enough ( I hope ) to realize that no matter what Trump does the media will be making up stories to drag him through the mud. Just ask Bush how well the media treated him. Trump has international business in many corners of the world. If he has business ties in Russia what the **** difference does it make. If you don't understand the potential risk, then you're not being honest with yourself. Trump has it within his ability to put all of this to rest. Haha, the Obama State Department organized the meeting between Sessions and the Russian ambassador. You got to love this stuff. Whats the risk? spell it out for me. Lets pretend Im a liberal idiot. Obama met with the Russian ambassador 20 plus times. Every one of the dem leaders wanting the investigation met with the Russians multiple times....that's what governments do....they meet. As best we can tell so far, Sessions didn't tell the ambassador to tell Vlad that after the election he'd have more flexibility... You know, like the last president did... Where's the outrage for that? LOL exactly. It's all just smoke and mirrors. They are so desperate that they are just flinging crap hoping something sticks. I mean for crying out loud, the last AG was involved in the death of Americans through illegal arms deals with cartels. These same people defended him until they were blue in the face. Sorry, not the last AG. You all know who I'm talking about. I hope it is deadwood as it is taking away from what is important. .....our progress!!! As many have said,"too many unforced errors!" I will standby this everyday and twice on Sundays .......Russia is NOT our friend in any form or capacity. Alarming how many seemed to be lulled into believing they are because of political affiliation or worse. I don't think anyone believes they are our friend, they just don't represent the threat that they once did. The House is still saying, as recent as yesterday, they have seen no evidence suggesting any inappropriate contact with Russia. 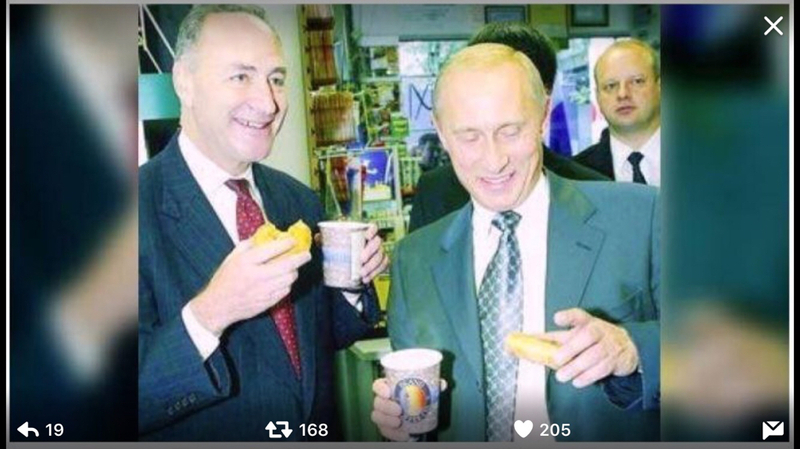 Politicians on both sides of the isle have been continuously meeting with Russia for years. It's what policy makers do. Especially When you are on a committee dedicated to oversight of an entity who explicitly operates in foreign theatres. You meet with foreign governments. This is nothing more than a pathetic attempt to discredit the current administration. Heck, John McCain who is a big pusher behind this Russian conspiracy has met with leaders of ISIS and AQ. There is photographic evidence of it. There are far more important things we should be focusing on. I'm fine with all u noted around the current findings. Except, "Russia does not pose the same threat as they did.!" Crimea, buzzing our ships, Syria, globally swaying elections, being very cozy with China, etc.....they are playing hardball around the world as we play little league soft pitch. As I noted, " lulled into the false sense of less of a threat is not a good mental place for any Americans.....no matter party affiliation!" A bully and a threat are not necessarily the same thing. Like you said we have been playing soft pitch. If we didn't, they would have nothing to stand on. Trump has barely been in office a month. It's a little early to judge how tough he will be with Russia. Remember, his entire campaign was about focusing on our own course first. Can you imagine the dust up the dems would cause if Trump or his admin issued a threat to Russia. Then you would be hearing how Trump is trying to start a war and how dangerous he is with the nuke codes. That the new admin is too hawkish and dangerous. Exactly how i am viewing this from my non affiliated political position as a American citizen who is observing with a very open mind!